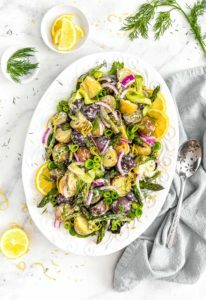 Hearty potatoes, bright earthy asparagus, and sweet red onions tossed in a luscious, lemony dressing is the “key to the mint!” This healthy vegan Lemon Herb Asparagus Potato Salad will quickly become a family favorite, perfect for picnics and parties! 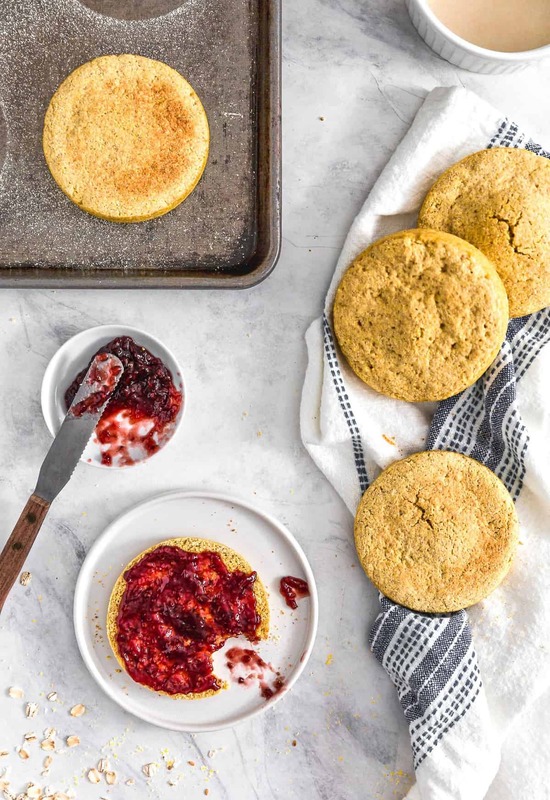 A fabulous Whole Food Plant Based recipe, vegan, oil free, refined sugar free, gluten free, no processed ingredients. Our garden is growing like crazy-crazy! Not just the normal crazy, but “cray-cray” as in “Yah, I am so over-joyed happy,” type of craziness. Right now, our grocery stores are overflowing with asparagus sales. It’s one of the few things we don’t actually grow in our garden, simply because our garden gets 360 degrees of direct sun, and for some reason growing asparagus has always been pretty much “hit or miss” for us. So, we wait for sales at the grocery store and then make all our asparagus favorites. 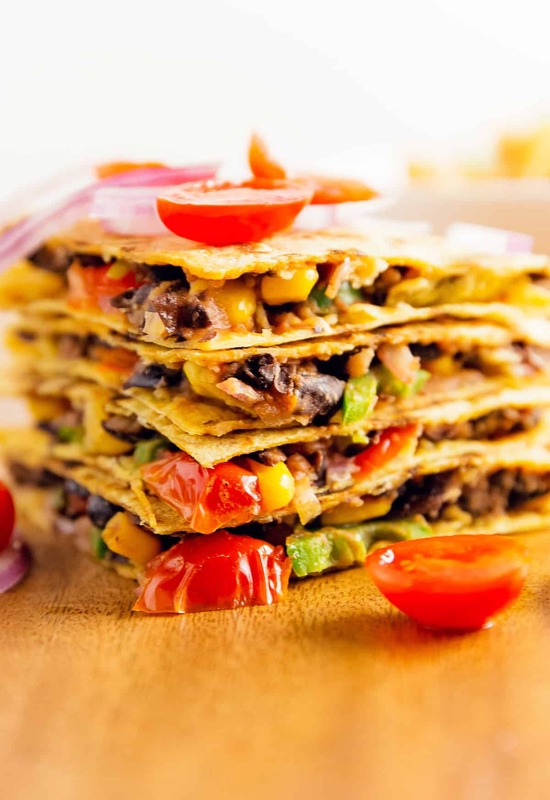 This recipe has been a family favorite for many years; however, we just recently converted the recipe to Whole Food Plant Based. 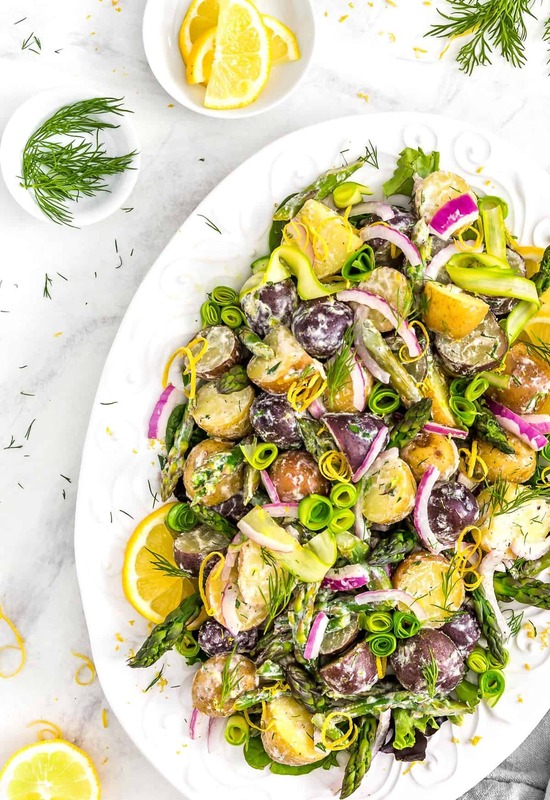 Our family has always been divided over how lemony this salad should taste. I prefer less lemon, while Dad likes a nice amount of lemon, and Mom likes a lot of lemon zest in this dish! Which I find totally funny, since Mom is not a lemon fan, but on this salad, she loves adding additional lemon zest. Michael loved this salad. He loves lemon flavors. I was so shocked that he loved this salad simply because he doesn’t normally enjoy potato salads of any variety. But he does love lemony types of dishes so this delicious dish won him over! YAY!!! Many European and Middle Eastern countries enjoy room temperature salads, which is kind of foreign to us here in the US. Most American salads are served cold. However, this salad is best served at room temperature. It really allows the creamy zesty lemon flavors to shine in the dressing. One thing that I have noted with cashew creams is that salad ingredients tend to really soak them up like a sponge, unlike traditional SAD salad dressings that have an oil base. Knowing this, we tend to postpone adding the dressing until we are ready to serve it and this makes all the difference in the world. 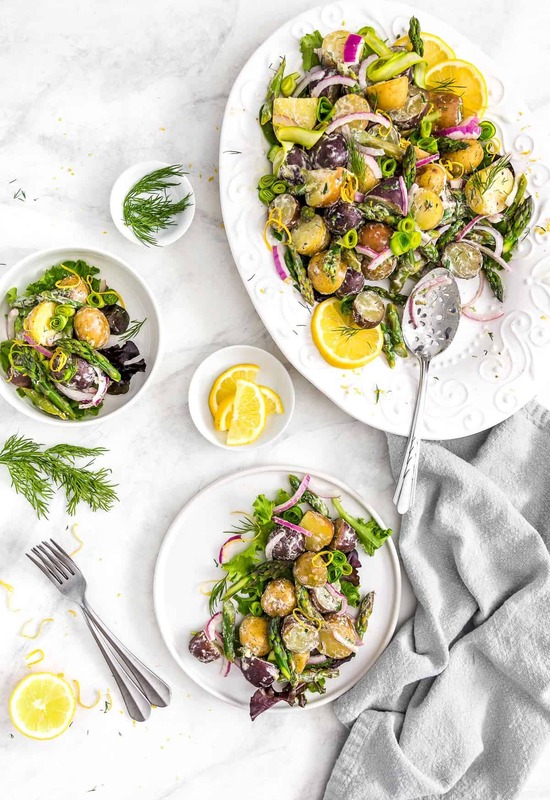 If you do decide to dress this salad later, then I would suggest allowing all the ingredients to come to room temperature again (coming out of the fridge). This salad is so refreshing and yummy! I love the fresh lemon zest as it really makes this dish come alive. As Monkey mentioned, I am not a lemon lover. 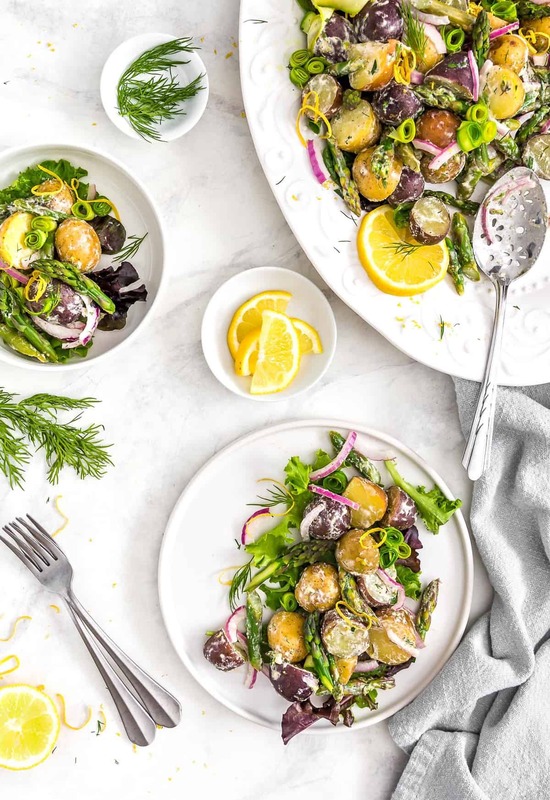 Don’t get me wrong, I enjoy lemon flavors, but I am not one of those people who goes crazy over lemon; however, for some odd reason, I absolutely adore the lemon in this dish. It pairs perfectly with the asparagus and baby potatoes. I just love it. This is one of my favorite salads. I have been making versions of it for years. TP absolutely loves this salad, mostly because he loves asparagus. It is one of his favorite veggies. 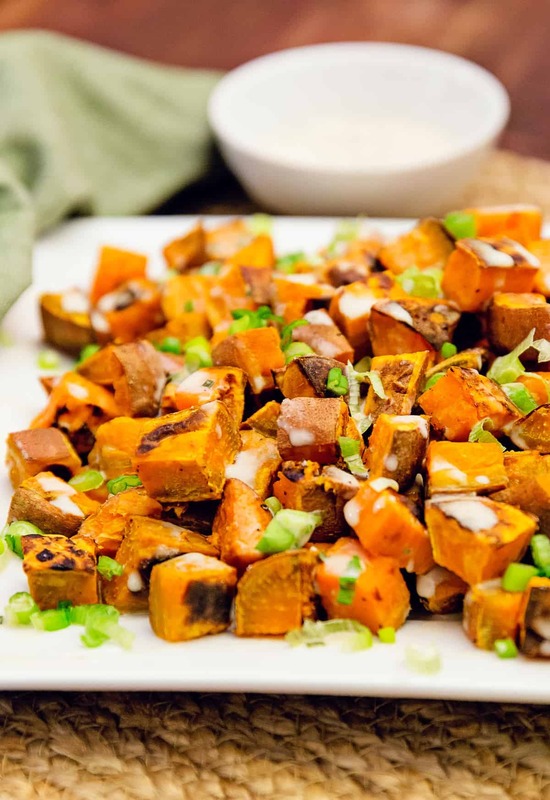 He also loves potatoes, so this dish has always been one of his all-time favorite salads. We hope you give it a try, and love this lemony goodness as much as we do! Quick soak the cashews by placing the cashews in a bowl, then add boiling water just to cover them. Soak for 20 minutes, then discard the water. Slice the baby potatoes in half, then rinse them really well in a colander to remove as much starch as possible. Place the baby potatoes in a large stock pot, cover with cold water, place them on the stove, and bring to a boil, then immediately lower the heat to a low boil. Boil for 25 to 35 minutes or until fork tender. Do not use a rolling boil. Gently boil the baby potatoes to preserve the potato shape and integrity. Watch them carefully because you want them to be just fork tender, not mushy or cracked. When the potatoes are tender, drain the water, and gently lay them out on a cookie sheet to cool to room temperature. In the meantime, snap off the tough ends of the asparagus, then cut the asparagus into 3rds on the diagonal. Steam the asparagus for 5 minutes or until desired tenderness is achieved. Watch them carefully, do not overcook them. You want crisp asparagus. It is better to error on the crisp side. Gently lay the steamed asparagus out on a plate or cookie sheet until room temperature. 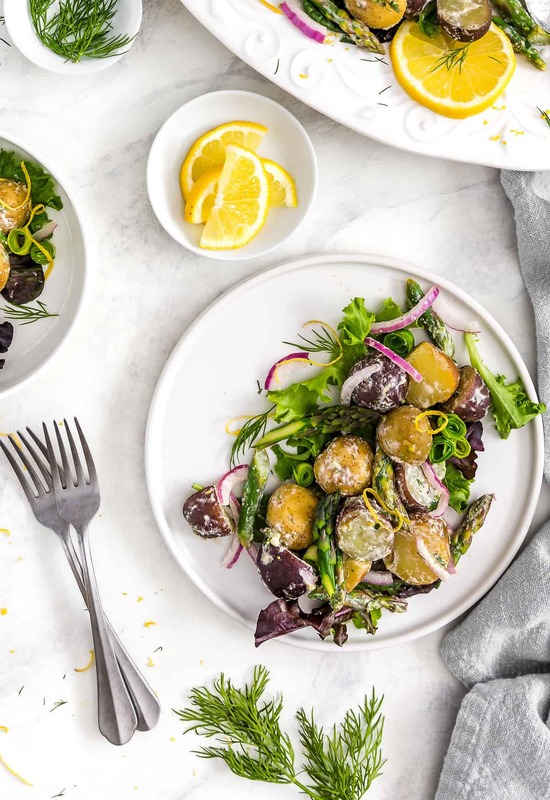 Prepare the Lemon-Herb dressing by placing the soaked cashews, garlic, lemon juice, water, white wine vinegar, almond butter, maple syrup, onion powder, garlic powder, minced onion, sea salt, and black pepper into a high-speed blender. Pulse until everything is creamy and well blended. Then place the salad dressing into a small bowl and whisk in the fresh dill weed, chives, and lemon zest. Allow to sit for 5 minutes for the herbs to marry with the dressing, then taste test the dressing. Adjust seasonings as needed – see recipe notes. Do not dress the salad until ready to serve. If serving this salad later, or the next day, refrigerate the veggies and dressing, bring everything to room temperature before dressing. 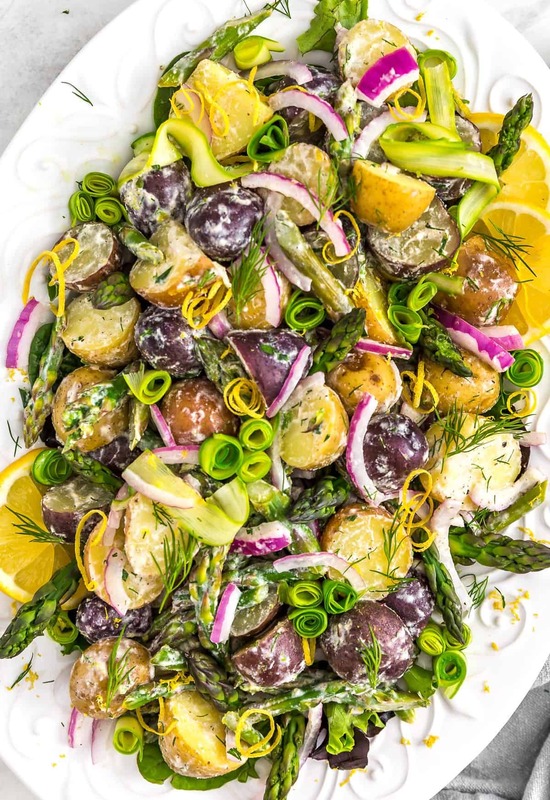 Gently place the room temperature cooked potatoes, asparagus, and diced red onions into a large bowl. Gently stir in the Lemon-Herb Salad dressing until everything is well coated. Taste the flavors, add more lemon juice or lemon zest, sea salt and pepper as needed. This salad is served at room temperature. 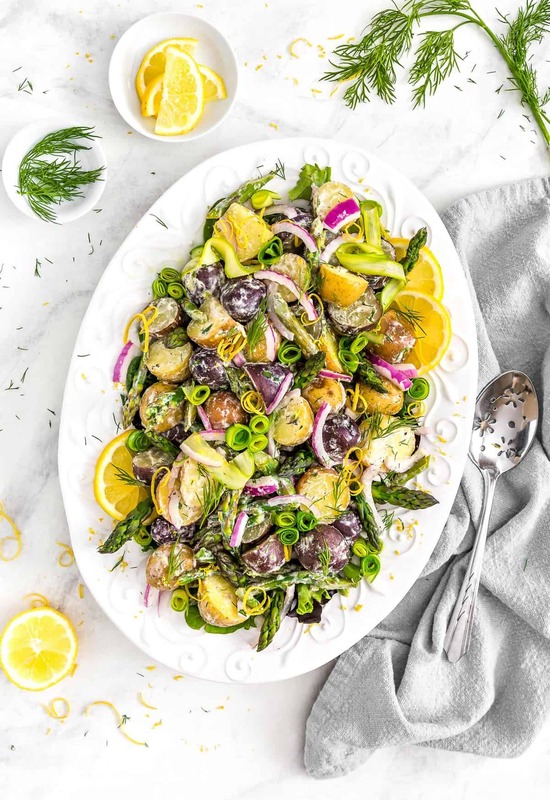 Serving at room temperature allows the herbs and lemon zest to shine in this beautiful lemony salad. *Lemon/Lemon Zest: The amount of lemon flavor is completely personal preference. Each of us enjoyed various amounts of lemon zest. 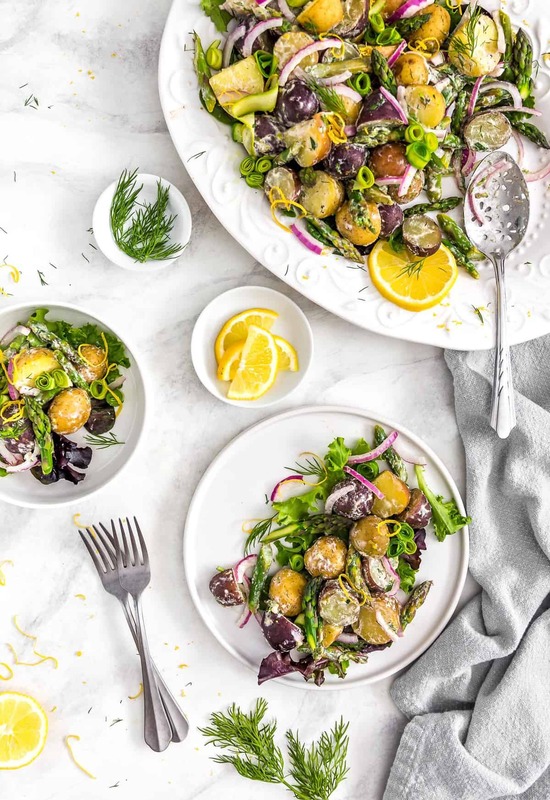 *Room Temperature/Dressing the Salad: Through various kitchen tests, we found that this salad is an excellent served at room temperature like many European and Middle Eastern salads. We also found that it is best if the salad is dressed right before serving as the potatoes tend to soak up the dressing over time. Storage: Refrigerate for up to 5 days. What attracts me to your recipes is how you present them. You have some rolled up vegetable adorning your plate. Is that shaved asparagus? It would be helpful if you included how you garnished this salad also. It is beautiful! We are so glad that you enjoy our photography and recipes. Thank you so much for your kind words. We typically try to describe the dish, including garnishes, but we’ve missed this one. Sorry about that. You are correct, they are shaved asparagus that have been rolled up.